Given recent failures, isn’t it time to debate ideas and strategy? The populist uprising championed by Senator Bernie Sanders, now America’s most (only?) 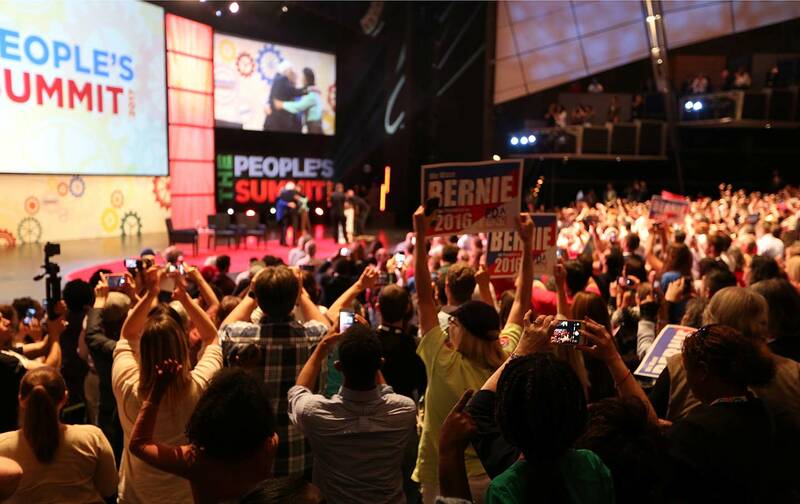 popular politician, gathered at the People’s Summit in Chicago last weekend. Over 4,000 activists redoubled their commitment to move from “resistance to power.” That commitment poses a direct challenge to the Democratic party’s leaders. A front-page report in The New York Times (“Democrats in Split Screen: The Base Wants it All; the Party Wants to Win”) summarized the perspective of the party’s political establishment. The party’s elected leaders and operatives have “a cold-eyed recognition” of the need to “scrounge for votes in forbidding districts” if Democrats are to take back a gerrymandered Congress. Their model is 2006, when the Democratic Congressional Campaign Committee, headed by Rahm Emanuel, purposefully recruited centrist challengers who focused on raising money and ran by tailoring their views to fit their district. Jon Ossoff, the Democratic candidate in the special election in Georgia’s upscale 6th District, which Newt Gingrich once represented, exemplifies the strategy. Ossoff, a 30-year-old former congressional aide, has run boldly against corruption and wasteful spending and for clean air and clean water. He opposes raising taxes on the wealthy, and also opposes “any move” toward a single-payer health-care system. He sells decency against division and unity against the “partisan circus.” Buoyed by the activist reaction to Trump, he has raised $23 million, much of which comes in small donations, in what is now the most expensive House race in history. If the Democratic Party has its way, it will recruit more Ossoffs to compete in suburban upscale Republican districts. That contrasts starkly with the movement energy displayed this weekend at the People’s Summit. Sanders roused the crowd by arguing that “The current model and the current strategy of the Democratic Party is an absolute failure.” The party must “decide which side it is on.” Repeating his call for grassroots rather than money politics, he urged activists to compete everywhere in the country, and to “knock on every door.” He insisted, “We have won the battle of ideas and we are continuing to win that battle.” He called on the party to stand for fundamental change: Medicare for All, tuition-free college, full employment, ending big money in politics, an end to mass incarceration, and more. This wasn’t a protest meeting. Activists shared plans on taking over their local and state Democratic parties, on recruiting and running candidates at every level. This Beltway conventional wisdom confounds common sense. Comparing the “cold-eyed” realism of the party establishment with the “dream” of the party’s “ascendant militant wing” doesn’t do any favors for the establishment. Over the last eight years, the “dispassionate” pros have lost the White House, both houses of Congress, and 1000 state legislative seats. They have set records for losing, not winning. Something has to change. The hand-wringing about party divisions is essentially a plea by the establishment to leave it in charge. When insurgent candidate Representative Keith Ellison seemed likely to become chair of the Democratic National Committee, the establishment didn’t let fears of division stand in the way of running another candidate in order to keep control. For years, pundits have written the obituary of a Republican Party, shattered by Tea Party and Christian Coalition divisions. Tea Party candidates won primaries, costing Republicans seats that they might otherwise have won. Zealous grassroots groups forced legislators to take ruinous votes out of fear of primary challenges. Yet, despite all that, Republicans have, as Speaker Paul Ryan boasts, “unified control” in Washington. The benefits of passion and engagement outweighed the costs of division. For example, in the recent Virginia gubernatorial primary, the Sanders- and Warren-endorsed challenger lost to the party’s designated candidate, but helped spark a dramatic increase in Democratic voter turnout and pushed his opponent to more progressive commitments. Finally, this isn’t about a consensus politics, in which the only question is which team—the red shirts or blue shirts—wins the game. The challenge is how to forge a broad majority for fundamental change in a country desperately in need of it. What the “cold-eyed” establishment hates to admit is that it has failed catastrophically in policy as well as politics. We’ve had two recoveries under two presidents—one Republican and one Democratic—in which inequality has gotten worse, leaving most Americans struggling with stagnant incomes and rising costs. Catastrophic climate change is already upon us. We’re squandering lives and resources fighting wars without end, with no strategy for victory. Our corporate-defined globalization strategy has shipped good jobs abroad and undermined wages at home. Our politics is corrupted by big money and entrenched interests. The old neoliberal consensus is bankrupt. The center cannot hold. Democrats need a big debate about what can be done—and there is no better time to have it then when the party is out of power. The populist revolt that is roiling politics here and abroad isn’t going away. The Sanders-Warren wing of the party has energy and passion. They are armed with a narrative of what went wrong, a bold agenda for change, and a growing grassroots organizing and funding capacity. The debate within the party isn’t a diversion or a liability. It is a necessary step to recovery.